I can finally and proudly say this is the best internet business training platform. If you want to learn all about building a website and make money without being scammed, this is definitely the one. With or without previous experience, you can receive training for success wherever you are. 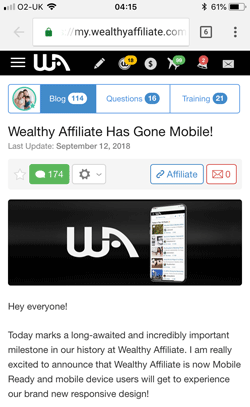 Yes, you've guessed it right, it's Wealthy Affiliate. And why I'm saying 'finally' - that's because there was one thing that kept me slightly annoyed for a long time. That the platform wasn't mobile friendly. You know how cumbersome to read a three-column desktop version on a mobile device. Especially leaving a comment was difficult, we were having to scroll the comment box from left to right as we wrote...until now. The mobile version is fully functional at last. I've always kind of reasoned that's because of the nature of content marketing work. Well, two reasons; one is for practicality. Desktop gives you more efficiency in terms of writing, researching, choosing images and optimising at the same time, comparing to mobile devices. The other reason may be how seriously you work on internet. You probably do need the right environment (i.e. home office) and equipment (i.e. desktop/laptop) to start a business. Perhaps Wealthy Affiliate discourage people who don't own a computer from joining? Especially those who only express themselves with emojis and abbreviations, such as "Thx, Plz, NP" may be considered 'not fit' for article writing? But that's a traditional (or ancient!) internet marketer in me speaking. "Mobloggers" (that's an obsolete word too) have always been around, many of them actually manage to use WordPress solely on a mobile device, write 2,000-word articles, place hyperlinks and optimise images just by using two thumbs and an index finger. There's no reason why anyone shouldn't try the same. There's no reason why you should have a home office and desktop to run an internet business as I imagined. Not anymore. Wealthy Affiliate covers all of the above areas over 110 lessons (NB: not in above order) plus weekly webinars, plus ad hoc video & text training, tips and advice. Primarily about affiliate marketing because that's how millions of others make money on internet. Unlike online stores, affiliate marketing does not require to have a stock inventory or knowledge of shipment and aftercare service. Earning passive income via your blog website is one of the easiest way for anyone to start with. There are some areas that you may feel not applicable, e-commerce for example. But if you decide to sell your own products at some point in the future, the training will come in very handy. Or how to use advertisement services such as on Google Ads or Facebook Business Ads. You may not be ready to pay third parties to advertise your campaign on your behalf yet, but once money starts to roll in regularly, that's the way you want boost your earnings. 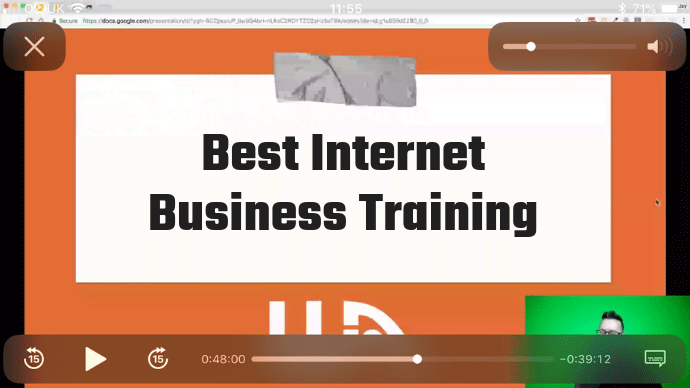 You can now take these internet business training courses on your mobile device at ease. Try if you haven't already, and see how you feel.